The unparalleled spread of technology in the last 50 years has produced a crop of medical conditions unique to it. Technology evolves far faster than human biology can adapt, and one result is the profusion of technology-based maladies which include everything from deep vein thrombosis to carpal tunnel syndrome and chronic back pain. One such condition is Computer Vision Syndrome (CVS) -- a form of eye strain and fatigue which creeps up on those who spend more than 3 hours a day at their computers.1 But with 40% of the planet's population now hooked up to the Internet,2 and the computerisation of most of the world's workplaces, it means billions of computer users are actually staring at their screens for much longer than 3 hours a day. Desk-bound jobs can mean people stay at their computers for the entire working day. As computerisation in the 21st century becomes more of a necessity than an option, professionals and others at potential risk include accountants, architects, bankers, engineers, flight controllers, graphic artists, journalists, academicians, secretaries and students, all of whom cannot work without the aid of computers.3 Then there are the gamers and virtual environment users: millions of children and adolescents play computer games for hours each day; similarly, users of virtual worlds such as Second Life and OpenSim are known for regularly spending half a day inworld; MMORPG and video gamers can be just as screen-bound. Computer vision syndrome, as such, is a health problem which is increasingly common. Symptoms include dry eyes, red eyes, blurred vision, double vision, eye irritation or burning, chronic headaches, and neck or back pain.4 Statistics indicate that 70 to 90 percent of people who use computers extensively suffer from one or more symptoms of CVS.5 There is also concern that heavy computer use may put children at risk for early myopia:6 a 2009 study conducted by the National Eye Institute noted that the prevalence of nearsightedness among Americans had increased from 25 to 41.6 percent of the population in the 30 years since 1972 -- an increase of over 66 percent.7 While the study offered no conclusions for these statistics, it is interesting to note that the years 1974 -1977 saw the arrival of the first personal computers on the market -- among them the Scelbi & Mark-8 Altair, IBM 5100, RadioShack's TRS-80 and the Commodore PET8 -- events which kicked off a personal computing frenzy in history which continues to this day. So what can we do? There are quite a few tricks we can utilise to lessen the risk of CVS. Ensure that there is sufficient contrast on the screen, such as black writing on a white background. Try to keep the screen brighter than the ambient light, so that your eyes do not strain to make out what is on the screen. Keep your monitor brighter rather than dimmer (but not TOO bright), as a brighter monitor encourages the pupils to constrict, thus allowing your eyes a greater range of focus. Avoid facing a sunlit window if you can, or use window shades to reduce glare. Anti-glare covers for flat screen monitors are also available, as are glare-reducing spectacles. Use a font size that is comfortable for your eyes - if you find yourself constantly squinting or leaning forward to read what is on the screen, the font size is too small. 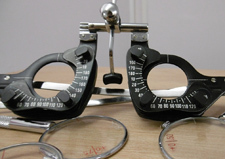 In addition, have your eyes examined regularly, and keep your prescription up to date. The American Academy of Ophthalmology also suggests the "20-20-20" rule for computer users: every 20 minutes, look at something at least 20 feet away, for at least 20 seconds. They also suggest using artificial tears to hydrate dry eyes, and using a humidifier.12 If, despite all these precautions, your eyes remain problematic, see your ophthalmologist.